You would think that after two spectacular incidents, enough would be enough for anyone. Never underestimate Touma Kamijou’s bad luck. Touma Kamijou always seems to run into Mikoto Misaka, and their interactions tend to invovle him being attacked by her. However, one day someone who appears to be Misaka’s identical sister appears, but not all is as it seems. After witnessing the twin’s untimely demise, Kamijou realizes that there are greater forces at work behind the scenes, and that Mikoto Misaka herself is in danger. Fans of action or fantasy stories containing science fiction elements with a more unique setting will likely find A Certain Magical Index very appealing. 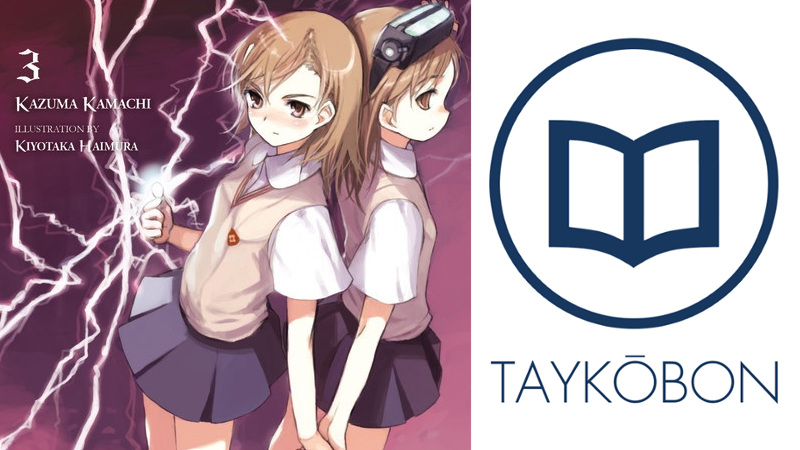 Author Kazuma Kamachi remarked at the end of both of the first volumes of A Certain Magical Index that Mikoto Misaka, a level 5 esper with a seemingly tsundere relationship to series lead Touma Kamijou, had failed to get a word in edge-wise. I think it’s fair enough to say that she got her word in this time around, as volume 3 is very much a Misaka-centric story. Changing things up from the previous volume, the story this book is focused more on the scientific side of things, more specifically, on espers. Previously, it had been mentioned that Misaka was one of seven designated level 5 (in other words, super powerful) espers. However, out of the seven the most powerful is actually a boy named Accelerator. His power, the ability to manipulate vectors, was a good representation of the continued interesting exploration of the world Kamachi has created. Despite Accelerator’s supposed power, his flaws as they are revealed were fascinating enough to make him a compelling villain despite having very little actual development. What was most interesting in this volume, as I mentioned before, was Misaka’s development. She was previously a background character mostly there to establish Kamijou’s ability (Imagine Breaker) early on, but this time around she was developed past the simple tsundere tendencies she displays towards Kamijou into a much more complex and intriguing addition to the cast. In fact, some of her moments with Kamijou that fleshed out her character were easily the most moving moments in the series thus far for me, making this volume actually my favorite one of the bunch. I also felt like this volume’s story flowed the best out of the three books thus far. This was primarily because of the way the mystery was handled, because although each of the three books have had a similar structure in the sense of finding a problem and then exploring why it is a problem and how to fix it, the previous two felt less cerebral. The plot was moved more by continuing conflicts instead of actual investigation. This volume, Touma has to do some digging to discover the secret behind Misaka’s ‘sister’, and while I felt that the previous stories were fine for what they were, I found this method of storytelling slightly more compelling. A Certain Magical Index has begun to grow into a series that I am quite fond about. I’m not sure if it’s the intriguing world, the moral dilemmas, or the various character relationships, but it seems to be a pretty solid series to recommend to light novel fans or even American readers who have yet to experience the Japanese take on science fiction. Even with that being said, the closer look at Mikoto Misaka and the conflict surrounding her and Accelerator was a particularly interesting arc of story, and it feels like Kamachi began to get into a groove with his writing of this volume. A Certain Magical Index Vol. 3 was authored by Kazuma Kamachi and published by Yen Press on May 19, 2015. A Certain Magical Index was an ongoing series in ASCII’s Dengeki Bunko imprint, and received two anime adaptions by J.C. Staff in Fall 2008 and Fall 2010. Volume 4 is currently available in English and volume 5 will release in North America later this year.